All party office members and residents are welcome to drop-off their signs at our North Van location with a donation to the Quest Food Exchange. Quest Food Exchange is a not-for-profit organization that provides dignified access to a variety of affordable and healthy foods to individuals facing food security challenges in British Columbia. The organization works in collaboration with food suppliers who donate their surplus food, and community resource partners who refer their clients in need. Before dropping off your signs please separate the different types of sign material. Separate the soft plastic (plastic similar to plastic bags) from the metal bases and separate the coroplast (hard plastic) part from the wood bases. Note that we can only take the coroplast, soft plastic, and metal components, we cannot accept the wooden sign parts. Thank you for your help in separating these materials and taking the initiative to recycle them! 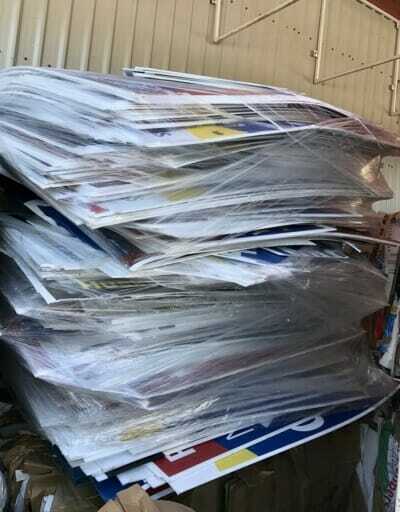 For more info on what happens to the signs check-out our blog post from last year about recycling Provincial election signs.